I am sure these have been reviewed a billion times, but here it is, review a billion and one from a new Mom. For three years I had gel nails. I would go every three weeks and get them done; I loved them. I always feel put together with my nails done (even if I don’t have make up on). When I found out I was pregnant I knew I was going to have to stop getting my nails done, and I did, around the 6 month mark. It was a sad day, but I knew I just wouldn’t be able to step away for a few hours to get them done – also, the cost. I missed my nails so I tried painting them. I tried multiple times. I waited between coats, I used a base coat and a top coat and nothing I did looked good enough. The polish would bubble or smudge (never have that problem with my toes!) – finally I gave up. No one has time for that and I knew once the baby came I definitely wouldn’t have time to paint my nails anyway. I am now used to seeing my finger nails bare but I still miss having them done. 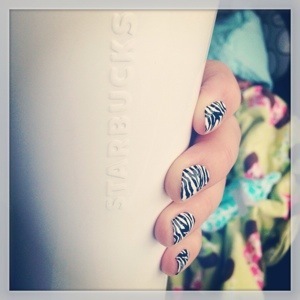 Site note, I guess you really shouldn’t be painting your nails too much anyway while you are pregnant… oops! 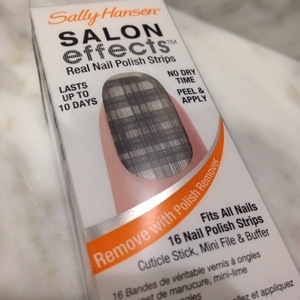 Enter Sally Hansen Salon Effects Real Nail Polish Strips. A few weeks ago I was at the dollar store and saw them for $2.50. My sister uses them and loves them so I thought I would give them a try. Can you really go wrong for $2.50? The patterns are not my favourite but $2.50. The application process was pretty simple. I was able to still text and do things while putting them on. No worry about smudges or waiting for them to dry. I did wait for baby to go to bed before putting them on but it was nice to know that if he did wake up I wouldn’t have to cover him (and everything else) in nail polish. I got lots of compliments on them. It was probably because of the wild print, but again, $2.50. They did start chipping within a couple days but not too bad. I left them on for about 2 and a half weeks, for picky people it was probably about half a week too long. One was chipping pretty bad but otherwise the only real issue was growth. I probably would have left them even longer but I am thinking about putting on a fresh set because we are going to a wedding. Removal was pretty easy, I soaked bits of cotton ball in nail polish remover and let them sit on my nails for a couple minutes before wiping them off. I did have to spend a few minutes removing little flakes of left over nail strips that seemed to get everywhere, but overall they didn’t take too long to get off. Would I spend $10 (regular price) for these? Not sure. I probably would if I wasn’t currently on a budget. But for $2.50 I will buy them again, if I can find them. I also found Essie and OPI strips. Reviews for those will come when I get a chance to try them. Disclosure: I purchased the Sally Hansen Salon Effects Real Nail Polish Strips myself and I was not compensated in any way for this review. All opinions are my own. This entry was posted in beauty, review and tagged beauty, feeling good, nail strips, review on July 9, 2014 by Courtnie.